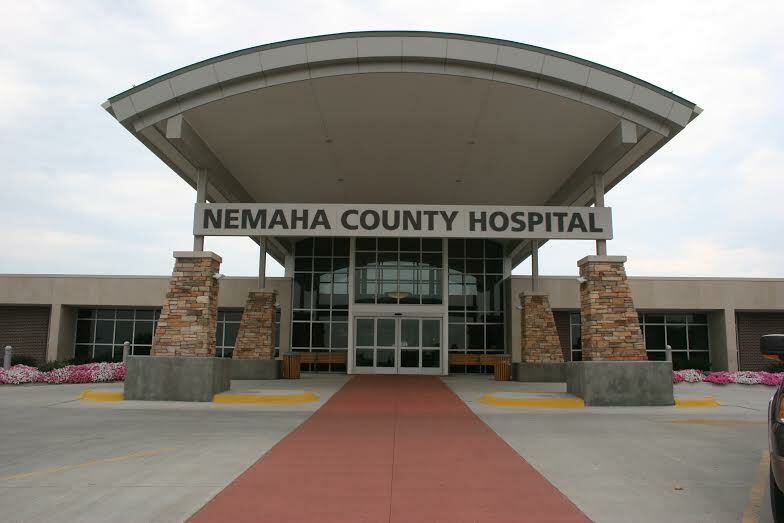 Nemaha County Hospital was dedicated and opened for public health services on May 1, 1963, in the original 26-bed building. Construction was funded jointly by bonds issued by Nemaha County and by Hill-Burton funds. The institution grew rapidly, and the need for expansion was fulfilled with an additional bond issue with completion in 1970. The added construction increased patient capacity to 44, including four intensive care beds, and provided new administrative offices. In 1974, Nemaha County Hospital added physical therapy, a new store room, maintenance garage, ambulance garage, dining room and remodeled the kitchen, all financed from the hospital’s operating fund. In 1992, the licensed bed capacity was changed to 39 and 5 bassinets. Former patient rooms were needed for pharmacy remodeling and nursing offices. Bed capacity was decreased to 37 in 1994 after remodeling for cardiac rehab. The bed capacity was decreased to 32 in 1996 due to decreased inpatient census. In April 2000, the voters passed a $4.75 million bond issue. Ground breaking began in June of 2000 and the remodeling, which was completed in three phases, was completed in April of 2003. The project added a new wing for outpatient services, new OR and procedure rooms, contemporary ER facilities, private patient rooms, and updates to many other departments. The bed capacity for Nemaha County Hospital is now 16. In 2010, NCH began a $7.75 million remodel of the front of the hospital. The remodel included a new classroom, server room, library, home health office, cardiac rehab room, administrative offices, boardroom, business office and expansion of the cafeteria. This remodel provided better access to the outpatient area of the hospital. In 2011, Nemaha County Hospital started a journey to better quality with Det Norske Veritas (DNV). DNV annually inspects our facility using the Federal Critical Care Hospital standards and the International Organization for Standardization (ISO). ISO is an international standard for quality and safety. Nemaha County Hospital is the first hospital in the State of Nebraska to be awarded by DNV-GL Healthcare full certification to ISO9001:2015 Quality Management System: the most widely accepted quality management system in use around the world. ISO 9001 brings science to the art of care giving: it helps to standardize processes around things that are proven to work, by the people doing the work, thus empowering frontline workers while creating an environment of predictability for the entire organization. In June of 2014, NCH developed and implemented a Pet Therapy program. In association with Domesti-Pups, we welcomed our first Certified Therapy dog to our facility. This program has had great success in providing comfort to many of our patients across all service areas. Ellie does a great job providing comfort to everyone who walks through the hospital doors.